In the Philippines, 6.2% of the adult population are established business owners and 18.4% are engaged in early-stage entrepreneurship (TEA). The country’s TEA rate is far higher than the average for Asia and Oceania (13%) . On the other hand, the country's business discontinuance rate (12.6%) far exceeds the ASEAN average (4.8%). Poor profitability and a lack of access to capital are the major reasons for business closure. 70.5% of Filipinos engaged in early-stage entrepreneurship are driven by the opportunity to improve their financial standing while only 29.4% are necessity-driven. Nearly half (46%) of all Filipinos have a very positive view of the entrepreneurial opportunities in their country; furthermore, 66% believe they have the entrepreneurial capabilities needed to start a business. Although perceived entrepreneurial capabilities of Filipinos are high, 89.5% did not receive formal training at school. Filipino entrepreneurs see owning a business as a path to being independent as well as the opportunity to earn a living and improve one’s economic lot. 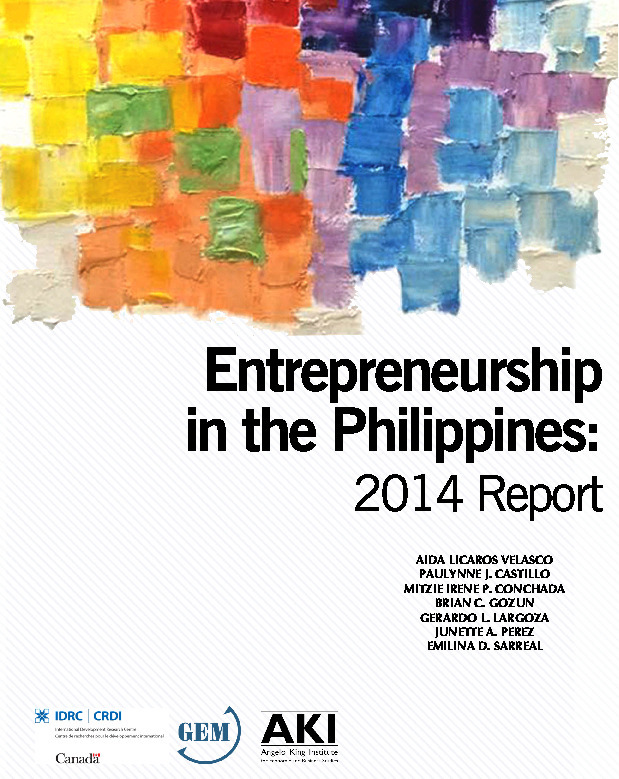 More than half (52%) of Filipino entrepreneurs are in the age group 18-44 years. Eighty –three percent of entrepreneurs are involved in retail trade, hotels, and restaurants while only 3% are involved in the transformative sector – manufacturing, construction, and transportation. Four percent (4%) are in agriculture, forestry, and fishing. Notably, there are more women (58%) involved in entrepreneurship at the early stage as well as in established business (55%). 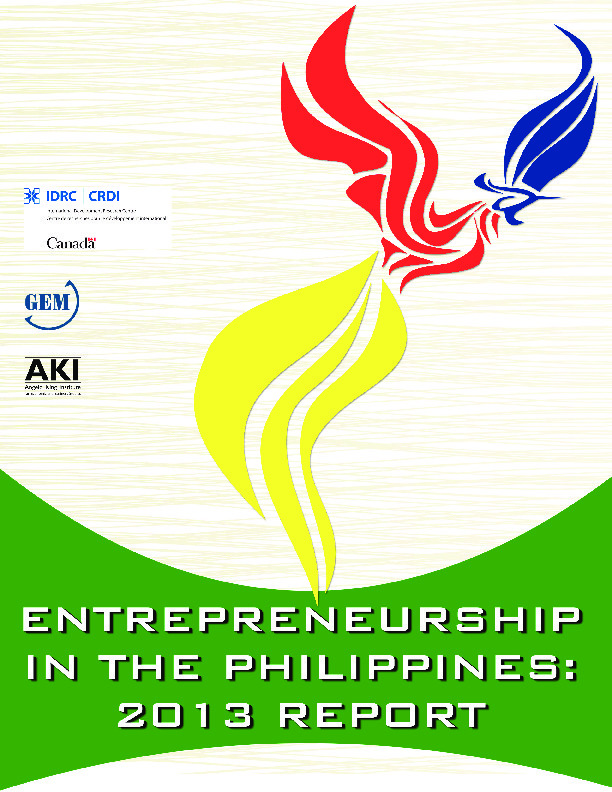 Entrepreneurship is seen by Philippine society as a very good means to improve one’s economic and social standing. This social and cultural orientation serves as one of the major drivers promoting entrepreneurship. The large domestic market with high consumer spending as well as good education and training also drives the population to try entrepreneurial activities. There are also several government programs that support entrepreneurship. Poor provision of training aimed at expanding and sustaining businesses. Entrepreneurship is encouraged in the Philippines through the activities of the different government departments, such as the Department of Trade and Industry, the Department of Science and Technology, Bangko Sentral ng Pilipinas and the Commission on Higher Education. Entrepreneurship is offered as a formal degree program at both bachelor and graduate levels (BS, MS, and PhD) aiming to provide formal training to aspiring entrepreneurs. Financial institutions like banks are required to set aside a certain percentage of their loan portfolio to the capital requirements of small and medium sized businesses. The Department of Trade and Industry, through the Bureau of Small and Medium Enterprise Development, have programs that assist SMEs in developing their entrepreneurial capabilities. The technological needs of SMEs are also being addressed by the Department of Science and Technology thanks to a program known as the Small Enterprise Technology Upgrading Program (SETUP). Partnerships between government, academia and industry are implemented in developing technology-based entrepreneurship through the business incubator and technology parks programs. Among Filipino youth, a new attitude is forming; they are progressively viewing entrepreneurship as a viable alternative to employment. The supporting framework for this is slowly improving, with the offering of formal academic degrees on entrepreneurship, the encouragement of industry, new graduate partnerships on start-ups, and enhanced interest from civil societies/ NGOs in supporting entrepreneurial development and activities. The biggest challenge the country faces in promoting entrepreneurship is to develop the capability and skills of Filipinos in starting and growing businesses; furthermore, it needs to promote innovation to increase penetration in both domestic and global markets. All this has to be well supported by the inclusion of entrepreneurship and management courses in the formal education system as well as the teaching of creativity and innovation among the youth. Capability building of entrepreneurs through formal and informal training has to be more actively pursued. The country must take advantage of new developments in the basic education sector, and make entrepreneurship a formal part of the curriculum; it should also redesign tertiary education programs to promote entrepreneurship as an alternative to employment. The results of the 2015 Philippine APS and NES show the confidence of Filipinos on entrepreneurship as a mover to a better life and more progressive society. Although government policies, structure, and bureaucracy are seen as constraints on growth and sustainability of entrepreneurial undertaking, more than half of the population see business opportunity in the country and close to 70% believe that they have the necessary skills to seize the entrepreneurial opportunities in the economy. On the other hand, there is a high business closure rate mainly due to unprofitable business operations and difficulty in accessing financing to continue business operations. 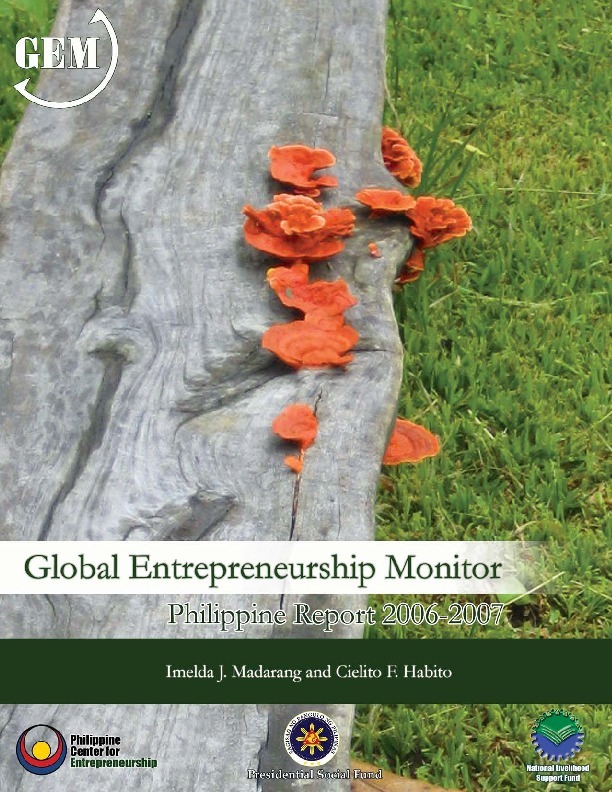 Entrepreneurship in the Philippines: 2014 Report considered more closely the prospects of micro and youth entrepreneurship in alleviating poverty and unemployment within the country. In the last few years, research particularly by Banerjee and Duflo at MIT’s Poverty Action Lab has suggested that some of the optimism about entrepreneurship as a bridge out of poverty in developing countries has been misplaced, and that entrepreneurial success is harder to come by than frequently believed. 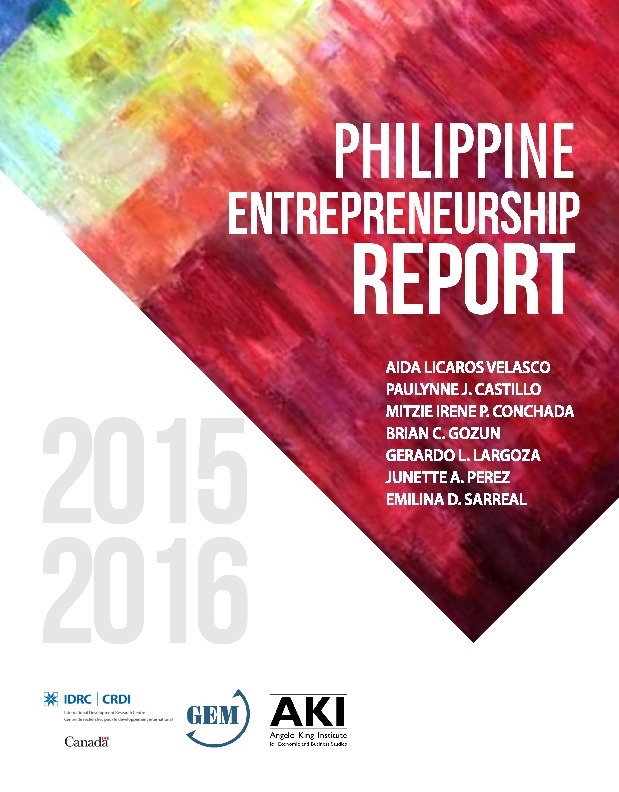 We find broad support for these ideas from the 2014 Philippine survey, and use this as an opportunity to rethink entrepreneurship strategy and policies in the country. In 2013, Approximately 18.5 million Filipinos were starting or running a new business while close to 6.6 million Filipinos were engaged in a business for at least 3 1/2 years. Filipinos are confident that they have the capability and opportunity to engage in business. They have a very low perception of business failure. More men are engaged in start-up business but more women are enaged in established business. The capacity of Filipinos to start a business, large size of the Philippine domestic market, high regard of society in entrepreneurs are main drivers of entrepreneurship in the Philippines. On the other hand, access to capital and capability to run and grow the business are two major barriers to entrepreneurs.